These recent sufferings had taken from her something of light and frolic girlhood, and left her with a manner more staid and sober. She was dressed in black, with longer skirts, and her hair caught up behind; and perhaps it was the mourning frock that made her look pale and thin… While I looked at her, she looked at me, and could not choose but smile to see my carter’s smock; and as for my brown face and hands, thought I had been hiding in some country underneath the sun, until I told her of the walnut-juice. observations: After reading The Nebuly Coat by the same author, I decided to re-read this: it was a massive favourite of mine in my childhood and teens, and I wondered if it would still enchant me. Well, if anything I loved it more than ever: because I could remember how enthralled I had been by it, I could remember the nerve-wracking scenes (even though I knew how they would end) of the banging coffins, the corpse to be searched, the auction tied to the pin in the candle. As referenced with the Nebuly book, Falkner does that thing of having real people with faults and problems, people who behave badly, and yet he has a forgiving manner, he does not judge them: he is like Chekhov. This story is full of greedy, ruthless people, and yet we can see through to their humanity. But it is also quite extraordinarily exciting – it’s not a long book, but has a large number of major scenes in bizarre settings, from the vault full of corpses under the church to the wellhouse at Carisbrooke Castle, from the merchant’s house in the Hague to the climax on Moonfleet Beach. The final line is: ‘and more than once I have stood rope in hand in that same awful place, and tried to save a struggling wretch; but never saw one come through the surf alive, in such a night as he saved me.’ Surely you’d have to be stone dead not to respond to that? Only Treasure Island can match this one for memorable characters and heart-stopping adventures. And, you can visit the original of many of the settings if you go to the coast of Dorset – 15 years after I first read it I was thrilled to do exactly that. Many an old-time book or fairy-tale features walnut juice in terms of skin-darkening. It seems so unlikely that it would work… but supposedly the explorer Richard Burton (not the actor) used it to pass for an Arab in order to visit Mecca. Walnut juice is also regularly recommended as a natural hair dye. 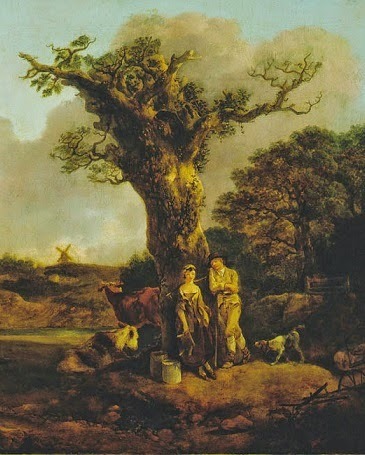 The picture, from the Athenaeum website, is called Rustic Courtship, by Gainsborough. Moira - There's just something about a tale of adventures isn't there? Books like that can keep you drawn in from first to last page. And that final line is terrific! Good to know that this one had staying power for you. Yes - of course nostalgia played its part, but I really think it's a great book, and one people might consider for reluctant young male readers, who might respond well to it. Hmm, not feeling it today I'm afraid. Definitely won't be there - J Meade no, but William Faulkner will be a yes. I thought I had commented on this one, but now I remember that Blogger or my computer or the internet was giving me problems. Interesting, but I will go for The Nebuly Coat first. I can see that Moonfleet gets a lot of love on Goodreads, so I should get to it sometime. I think that's the right decision Tracy - this is a great adventure book, but the Nebuly Coat is a very grown-up novel by comparison.